Why are IT outsourcing contracts almost always delivered over-budget and over-schedule? 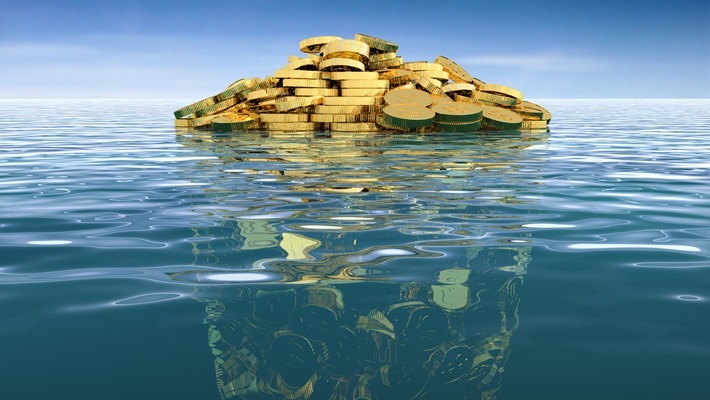 Why do IT outsourcing contracts almost always fail to achieve their planned value? How come IT contracts seem to be afflicted with this curse more than any other area? The common answer is that (i) the requirements change, and (ii) that handovers from the pre-contractual phase to in-service management are always done poorly. These are both true although hardly explain the complexity of the situation. If requirements change were an issue then freezing requirements would solve it – it doesn’t. The complexity of large ICT projects is derived directly from the fact that not all the requirements are even knowable from the outset. This high level of unknown-unknowns, coupled with the inherent interdependence of business and system requirements, means that requirements creep is not only likely but inevitable. Secondly, (ii) handover issues should be able to be solved by unpicking the architecture and going back to the issue points. This too is never so simple. My own research has shown that the problem is not in the handover but that the subtleties and complexities of the project architecture is not usually pulled through into the management and delivery structures. Simply put, it is one thing to design an elegant IT architecture. It is another thing entirely to design it to be managed well over a number of years. Such management requires a range of new elements and concepts that never exist in architectural design. The primary factor contributing to excessive cost (including from schedule overrun) is poor financial modelling. Simply put, the hidden costs were never uncovered in the first place. Most cost models are developed by finance teams and uncover the hard costs of the project. There are, overall however, a total of 3 cost areas which must be addressed in order to determine the true cost of it outsourcing. 1. Hard costs. This is the easy stuff to count; the tangibles. These are the standard costs, the costs of licensing, hardware, software etc. It is not just the obvious but also includes change management (communications and training). The Purchasor of the services should be very careful to build the most comprehensive cost model based on a detailed breakdown of the project structure, ensuring that all the relevant teams input costing details as appropriate. 2. Soft Costs. The construction industry, for instance, has been building things for over 10,000 years. With this level of maturity one would imagine that soft costs would be well understood. They are not. With project costs in an extremely mature sector often spiralling out of proportion it is easy to see that this might also afflict the technology sector which is wildly different almost from year to year. Soft costs deal with the stuff that is difficult to cost; the intangibles: The cost of information as well as process and transaction costs. These costs are largely determined by the ratio of revenue (or budget in terms of government departments) against the Sales, General & Administration costs, i.e. the value of the use of information towards the business. Note that this information is not already counted in the cost-of-goods-sold for specific transactions. Soft costs go to the very heart of how a business/government department manages its information. Are processes performed by workers on high pay-bands? Are workflows long and convoluted? The answers to these questions have an exponential effect on the cost of doing business in an information-centric organisation. Indeed, even though the cost of computing hardware is decreasing, the real cost of information work – labour – is increasing. This is not just a function of indexed costs but also the advent of increasing accreditation and institutionalisation in the knowledge worker community. Firstly, there is greater tertiary education for knowledge work which has hitherto been unaccounted for or part of an external function. The rise of the Business Analyst, the Enterprise Architect (and a plethora of other “architects”) all serve to drive delivery costs much higher. Not only are the costs of this labour increasing but the labour is now institutionalised, i.e. its place and value is not questioned – despite the data showing there seems to be limited economic value added through these services (i.e. no great improvement in industry delivery costs). 3. Project Costs. Projects are never delivered according to plan. Requirements are interpreted differently, the cohesion of the stakeholder team can adversely impact the management of the project, even the sheer size and complexity of the project can baffle and bewilder the most competent of teams. Supply chain visibility, complicated security implementations and difficult management structures all add to project friction and management drag. There are many more factors which may have an adverse or favourable effect on the cost of performing projects. In the Defence community, Ph.D student Ricardo Valerdi created a cost model – COSYSMO – which isolated 14 separate factors peculiar to systems engineering projects and gave these factors cost coefficients in a cost model. Ultimately, each factor may be scored and the scoring then determines the effort multiplier, usually a number between approximately 0.6 and 1.8. Naturally, when all factors are taken into account the overall effect on the contract price is significant. More importantly, for IT implementations, the “project” is not short. 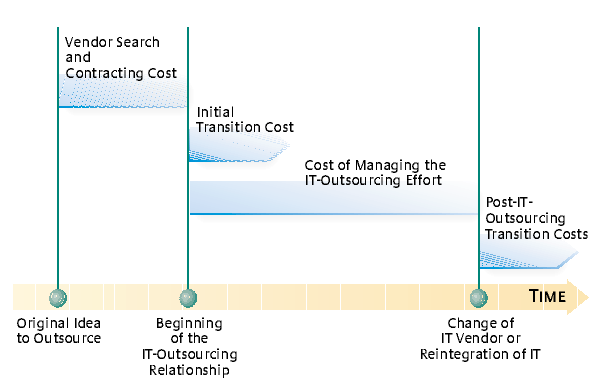 IT outsourcing projects are generally split into 2 phases: Transition and Transformation. Transition involves what outsourcers call “shift-and-lift” or the removal of the data centres from the customer site and rear-basing or disposal of the hardware which allows the company to realise significant cost savings on office space. During the second phase – Transformation – the business seeks to realise the financial benefits of outsourcing. Here, a myriad of small projects are set about in order to change the way a business operates and thereby realise the cost benefits of computer-based work, i.e. faster processes from a reduced headcount and better processes which are performed by workers on a lower pay-band. IT outsourcing is not just about the boxes and wires. It involves all the systems, hard and soft, the people, processes and data which enable the business to derive value from its information. Just finding all of these moving parts is a difficult task let alone throwing the whole bag of machinery over the fence to an outsourcing provider. To continue the metaphor, if the linkages between the Purchasor and the Vendor are not maintained then the business will not work. More importantly, certain elements will need to be rebuilt on the Purchasor’s side of this metaphorical fence, thus only serving to increase costs overall. The financial modelling which takes into account all of these people, processes and systems must, therefore, be exceptional if an outsourcing deal is to survive.